At nearly 106 years old, Shiloh Baptist Church, located on the corner of Washington and 10th Street in Downtown Alexandria, is one of the oldest structures in the city. Remember, of course, Alexandria was burned to the ground during the Civil War, and ever since then, as our local historic preservationists like to say, we’ve suffered from a “Tear It Down” mentality. According to one study of Downtown properties, at one point, Alexandria had lost nearly 90% of her historic buildings, due, in no small part, to the construction of Interstate 49. And as Dale Genius at the Louisiana History Museum can attest, many of the buildings we demolished were architectural gems. In what was perhaps a misguided attempt at embracing modernization, we seemed to prefer demolition instead of renovation. When you look at the photos of what we have lost, it’s difficult not to feel a sense of frustration. Although it may be understated and simplistic, I’ve always liked Shiloh Baptist Church. Notably, if you’re driving north on Interstate 49 and decide to exit into Downtown Alexandria, Shiloh Baptist Church is one of the first things you’ll see; it’s almost like a gateway monument, hugging the street corner, a plain yet eye-catching representation of Alexandria’s history and its architectural themes. 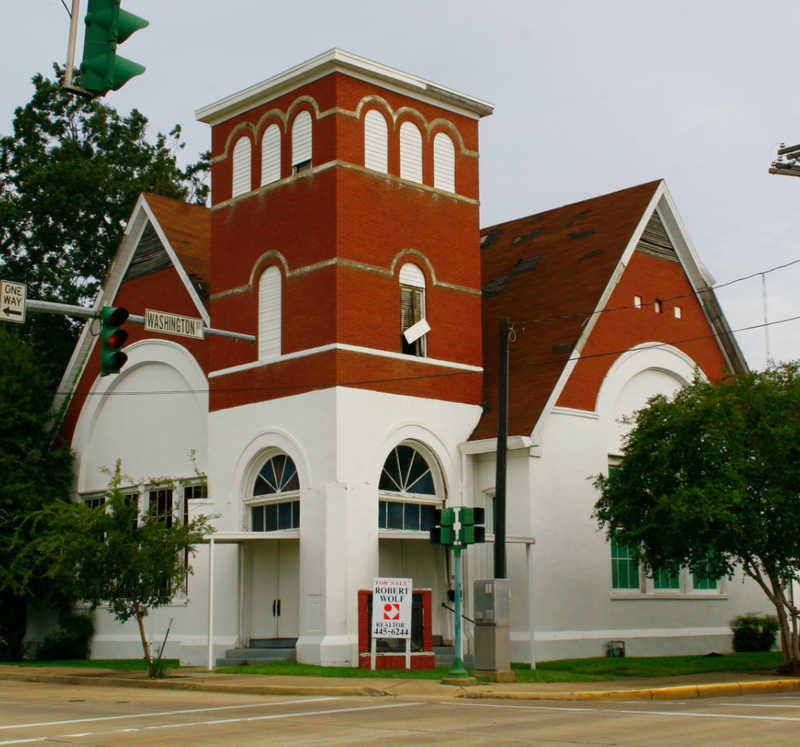 For over 100 years, Shiloh was one of the oldest African-American churches in Central Louisiana. The congregation was actually organized in June of 1882, over twenty years before the current church was built. Today, the building remains vacant and in need of major renovations. After being threatened with demolition earlier this year, thankfully, it was spared from the wrecking ball after a handful of local preservationists took action. There is still much work to do, but like I asked about the dairy barn, what do you think Shiloh could or should become? I’m not sure exactly how it could be done, because I think it would really best be served by some sort of local non-profit collectively serving the needs of the region, but I think this building is the ideal location for some sort of Ecotourism Centre for Central La. This about it, we are the primary location in the state for hunting, fishing, camping, hiking, cycling, walking, boating, water skiing, even golfing. Our draw as for getting people from other parts of Louisiana to our region is nature and the outdoors. And, just about everything in Sportsman’s Paradise is pretty much centered on Alexandria. In fact not a single one of those activities I listed is more than a 15 minute drive from the location of Shiloh. Currently there really is no central clearinghouse for all this or a central meeting place for people who do come to the area to partake of our surroundings. I know there are regular road biking and mountain biking meet ups here every weekend but currently they all meet up at the Airport Exit of I-49 and fill up the truckstop and Burger King parking lots. I’ve even run into several people in New Orleans out biking who once they find out I’m from Alexandria go on and on about how much they like biking up and down Bayou Rapides and such. Why not set up something right there in the middle of everything, easily visible and accessible from I-49, with tons of empty parking all around it, and between all the roads that lead to all this outdoor stuff, right there in downtown at Shiloh. It could be made mostly self-sufficient if not even profitable. Bring in private interests to rent canoos, or rent bikes, or just run a bicycle repair service, sell hunting and fishing licenses, let someone put a cafe in, etc. With existing hotel rooms available downtown, and more coming soon, and restaurants and bars, and again more of those coming soon, having a facility that brings people into that area makes sense. Sure people going camping will stay at campgrounds. But, people up for a couple of days of cycling will stay in a hotel and eat at a restaurant. Same for someone coming deer hunting or duck hunting or whatever. You have to embrace what your people and your area are all about, and an ecotourism centre would not just embrace it but showcase it. Shiloh — Gateway to Kisatchie? Until we make a more agressive push for tourisum in Central Louisiana, we will continue to stagnate. Bike and walking trails form about a 2% draw. There are a multitude of more important things that could draw people here. We choose do not recognise them. Untill we step back and look at the area from a different mindset, we will continue to tread water. The plan of the one who bought it is to de-consecrate it (I believe that is the word) as a church and to reopen it as a restaurant.